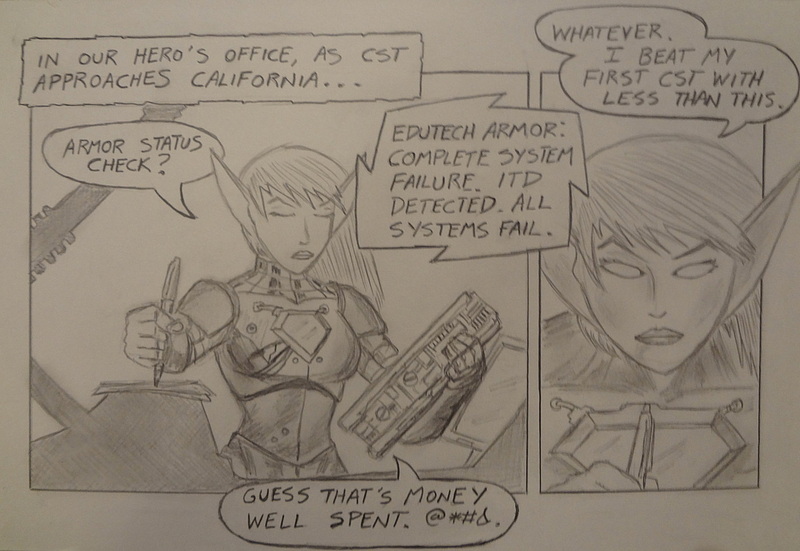 CST Approaching: Have a Force Field and a Flexible Plan | Tales of Adequacy! So, for a small amount of time today, I had internet service at school. This successfully brought my classroom back into the late 20th century. It wouldn’t be such a big deal if attendance wasn’t done as a mandatory online function. Attendance is a pretty important contractual obligation, and I’ve been pretty much using my smartphone to take it. That’s frustrating. Add to that the fact that the basic method of professional correspondence has become e-mail, and you get a frustrating kind of isolation. Especially when your science teacher decides that she should in fact collaborate, but decides to do so primarily through e-mail. Frustrating. I’m supposed to teach 21st century skills, to a group of students who are supposed to be college and workforce ready in five years…but with a minimum of the basic items that would be required to run a modern small business. My favorite irony is our copier situation. Last year, teachers were up in arms about not having copiers on our campus, and being unable to make worksheets. I rarely use worksheets of any kind, but saw that there was a valid point in the need for consumable handouts. Different teaching styles, and so forth. Ultimately, the district engaged, district wide, in a contract with Toshiba for advanced multifunction copiers at every school, of the same type. This cuts cost with a unified service contract, and one parts bundle. Smart. For six weeks, this advanced copier has been sitting in our seventh grade staff room, and none of us have the access codes to use it. This is a torment not unlike that given to Tantalus. Today, I wanted to reproduce test pages for a simulated CST, to go over the strategies of test taking, and generally not being intimidated by high stakes testing. However, the laser printer that I was using gave up the ghost, and I had no code for use with the expensive brand new copier sitting six feet away. Oh….and I had the internet, intermittently for the day. More interesting, the “new” wireless network is set up, and apparently live…except that none of our hardware, which is older than the network, is configured to talk to that network. Not unlike telling a two dimensional being about spheres and cubes…kind of unfair, and unusable to a being that only gets to deal with squares and circles in their own plane. Less than a week until CST exams. We are expected to have a goal of 700 API…which would be a leap of about sixty points. That’s an impressive jump, and pretty much twice the jump that we made last year. At this point, I’m looking more realistically at numbers around 660. However, the questions stand: How are we supposed to become competitive with schools on the Westside, in the 700 range, when we don’t have the collaborative or technological infrastructure of those schools? Secondly…why buy a tablet for every child next year, before resolving the infrastructure questions that prevented laptops from being useful this year? I managed to give my simulated CST exam, and debrief my students about it today. The kids are looking strong…very strong, going in. My students, that is, which are worth about four percent of the school’s API. On some level, I wonder what I could do with superior collaboration, or the kind of real technology that the Westside of LA has to teach with. My pretest showed an almost zero “fail rate”…that is to say, almost all students at Basic skill band and above. If technology driven education is all it is cracked up to be, theoretically those numbers could be even higher. Instead, I cobble together an internet connection from spare parts and scavenged ethernet cables, and get questioned by our Pledge LA CEO on why I don’t use the internet based learning technology more often. I ran the last panel of today’s art (maintaining the “different costume daily until CST) through the Obama style filter. Why? For the caption mostly. CEO’s and other out of classroom people have this phrase about things that should work: “you need to be flexible.” This means that they won’t fulfill their end of providing you the basic needs in a timely fashion, and you are supposed to MacGuyver your way through it. Success at that is what’s expected, and pointing out the other party’s obligation…that’s just complaining. A force field and a flexible plan. Basic equipment for inner city education. The part that burns? My co-teacher and I spent the summer setting up a system that has not worked out for eighty percent of the teachers involved. We’ve bickered with each other about it, and the Suits involved are deaf to the real time issues present. Those same suits will be high pressure, high stakes about our obligations, which are solid teaching every day, resulting in high student test scores. I’m impressed with my students, and they will do well…but i can’t speak to the whole school. I can speak to statistical trends, which suggest that Pledge LA will be less than happy…despite not coming through on major initiatives. I’ll be sure to mention that at headquarters on Thursday. Next: As CST approaches, pressure mounts! And moisture farming!